And Jacob came to Shalem, a city of Shechem – Or rather he came safe, or in peace, to the city of Shechem. After a perilous journey, in which he had met with many difficulties, he came safe at last, into Canaan. Shalem–that is, “peace”; and the meaning may be that Jacob came into Canaan, arriving safe and sound at the city Shechem–a tribute to Him who had promised such a return (compare Genesis 28:15 ). But most writers take Shalem as a proper name–a city of Shechem, and the site is marked by one of the little villages about two miles to the northeast. A little farther in the valley below Shechem “he bought a parcel of a field,” thus being the first of the patriarchs who became a proprietor of land in Canaan. One hundred pieces of money-Literally, “Iambs”; probably a coin with the figure of a lamb on it. He erected an altar -tn thankfulness to God for the good hand of his providence over him. So that he might keep up religion, and the worship of God in his family. He dedicated this altar to the honor of EI­ Elohe-Israel, God – the God of Israel: to the honor of God in general, the only living and true God, the Best of beings, the First of causes: and to the honor of the God of Israel, as a God in covenant with him. God had lately called him by the name of Israel; and now he calls God the God of Israel; though he be called a prince with God, God shall still be a prince with him, his Lord and his God. Jacob was on a journey to Canaan the promised land. Why was this journey important to him? Is it important to us? When he got there, he bought some land. What does this tell us about Jacob? Jacob built an altar there. Why? It is said Jacob also built a well there. The well appears in our New Testament lesson. Jesus has been in Judea, ministering with his disciples. But the Pharisees in Jerusalem have been closely monitoring the revival meetings taking place near the Judean capital. More and more people are flocking to Jesus, so the religious protectors of the status quo are making it more dangerous for Jesus in Judea. It is time to return to his native Galilee. Now he had to go through Samaria. There were three routes between Galilee and Jerusalem. (1) Along the coast, (2) along the Jordan valley, or (3) along the central ridge road that wound north through the passes in the mountains. The latter was the fastest and most direct, though it required travelling through Samaria. Antagonism between the Jews and Samaritans sometimes caused tension along this route. hour”) while his disciples went into town to buy some food. Jesus is “tired from the journey” This reminds us that Jesus is fully human, as well as fully divine. A tired Jesus is sitting at the well, waiting for the disciples, when a woman appears. Jesus’ request for a drink of water was strange at several levels. 1. Gender difference. In that culture men didn’t usually initiate a conversation with women they didn’t know. 2. Religious difference, as the woman herself observes (4:9). Jews considered Samaritans to be unclean. 3. The Woman’s Status. As the story develops, we find that the woman had had five men and was living with a sixth. She doesn’t refuse Jesus’ request but she wonders aloud why he would go against the social norms to ask her for a drink. Jesus ignores her lack of understanding, but continues to explain the gift he is talking about. He compares literal water with spiritual water. Jesus makes to statements about this water: They will never thirst. They will have eternal life. 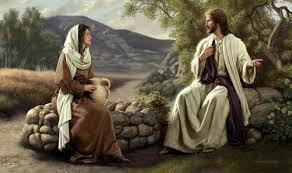 Why do you think Jesus went against the social norms to communicate with the woman? Why do we hesitate to go against social norms to share the good news? How do we balance our need to obey God and our need to live peaceably in our culture? Jesus’ words to the woman in verses 10-13 seem to imply that all people are spiritually thirsty. Does the woman seem spiritually thirsty at this point? What caused her deep thirst to surface? What does this teach us about our own witness?